NaturaLED 42 Watt LED wallpack fixture. 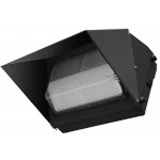 This LED wall pack/outdoor security light is the ideal replacement LED fixture for up to a 150 watt metal halide. Heavy-duty cast aluminum one-piece housing, is epoxy coated and will withstand years of outdoor use. Can mount to recessed outlet box or direct to surface, based on your installation needs. Photocell compatible for dusk to dawn operation (field installed button photocell) Excellent thermal design 12-30 ft. height performance Shatter-resistant glass Operating Temp. : -30F - 130F Wet location listed UL listed DLC listed - Included cutoff shield is required to meet DLC qualification, but shield can also be removed if needed. 40 Watts 120-277 volts 75 CRI With a rated life of 50,000 hours, this LED wall pack light fixtures provides years of maintenance free use. Gone are the days of replacing light bulbs every few years. Experience the craze of LED lighting, at this economical price. 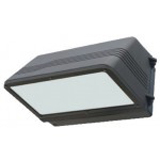 Energy savings and maintenance savings make this LED wall pack light an affordable solution. These LED wall packs are ideal for car wash lighting, commercial building security lighting, and many other applications.